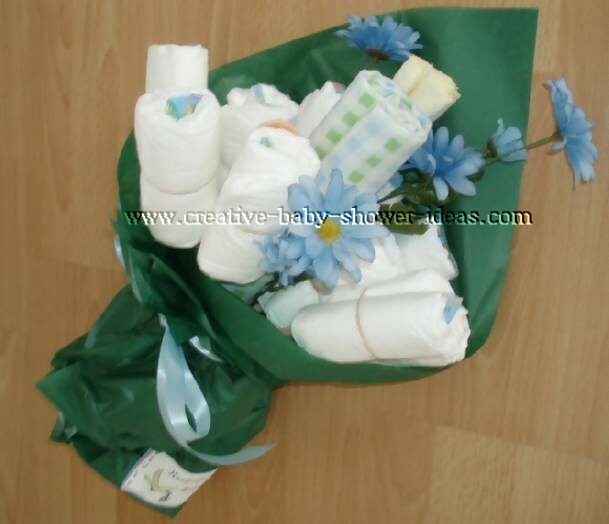 Making a baby bouquet for a new mommy can be a fun way to give useful items. 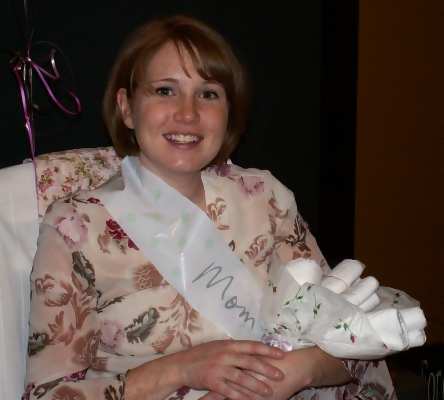 Get some creative ideas to make for that special mommy on your list! Use our instructions to make baby sock roses just like the ones in the photo gallery below. ***Note*** Each photo in our galleries have been graciously submitted to us by viewers like you. 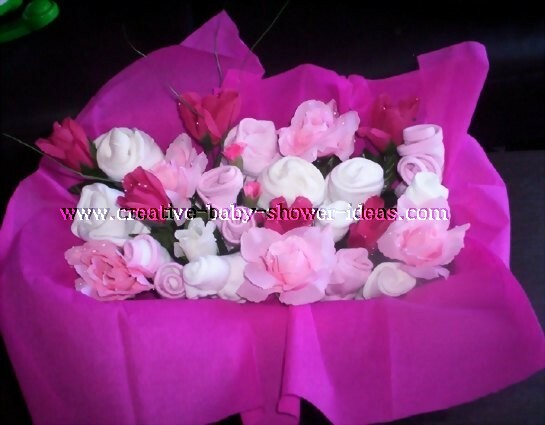 This bouquet makes a lovely centerpiece at any baby shower or turning up at the hospital with this bouquet will sure make an impression. In this rose bouquet there are bibs, vests, sleep suits, socks and scratch mitts all rolled up to look like roses. There are also artificial flowers put in. The nappies are underneath all of it on the bottom. I started by taking infant diapers and rolling them up and holding them in place with rubber bands. Once they were rolled, I inserted 12" dowel rods (no thicker than 1/4 inch wide) through the middle of the diaper. I then rolled up some goodies, such as baby t-shirts, blankets , and bibs - and also inserted dowel rods in the middle. Once I had about a dozen rods I gathered them into a bouquet (mainly diapers) and used a heavy duty rubber band to wrap around the bottom of the rods (one-quarter from the bottom). If the bouquet needed more stability, I added more goodies around the middle (where you would hold the "flowers"). Once all were wrapped up, I used some flowers and inserted them into the bouquet and them the gift flat on top of some coordinating tissue paper. I then secure with some tape (so the tissue paper doesn't come loose) and then wrap with ribbon! All are made with coordinating colors.